José Limón, the Notre Dame Professor of American Literature and Julian Samora Professor of Latino Studies, has been elected to the Fellows of the American Folklore Society in recognition of his outstanding work in the field of folklore studies. Established in 1960, the Fellows of the American Folklore Society is an honorary body of folklorists who have made a significant contribution to the discipline. The society sponsors activities to advance folklore studies, including mentoring programs for students, plenary sessions at the annual meeting, and special awards. “There is a great tradition of eminent folklorists and anthropologists who have been inducted into the Fellows of the American Folklore Society based on their research,” Limón says. “Among them are Alan Lomax, Albert B. Lord, Melville Jacobs, and my own distinguished mentor, Américo Paredes. Limón directs Notre Dame’s Institute for Latino Studies and is one of the country’s foremost scholars of Latino literature. Although English is his home department, he holds concurrent appointments in the Department of American Studies and the Department of Anthropology. His academic interests are varied and include cultural studies, Chicano literature, Mexicans in the United States, U.S.-Mexico cultural relations, critical theory, folklore and popular culture, and literature of the U.S. South. Limón’s most recent book, Américo Paredes: Culture and Critique, focuses on the founding figure of Mexican-American studies. 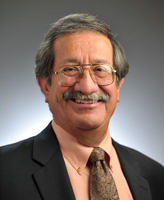 In addition, he is the author of three other major books in the field of Latino studies— American Encounters: Greater Mexico, the United States and the Erotics of Culture; Dancing with the Devil: Society and Cultural Poetics in Mexican-American South Texas; and Mexican Ballads, Chicano Poems: History and Influence in Mexican-American Social Poetry—and more than 35 articles. He is currently working on two book projects, Hispanic Self-Fashioning: The Making of a Mexican-American Middle Class Identity and Neither Friends, Nor Strangers: Mexicans and Anglos in the Literary Making of Texas. Originally published by Carrie Gates at al.nd.edu on December 16, 2013.